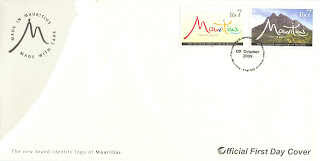 Mauritian Philatelic Blog: Mauritius c'est un plaisir! 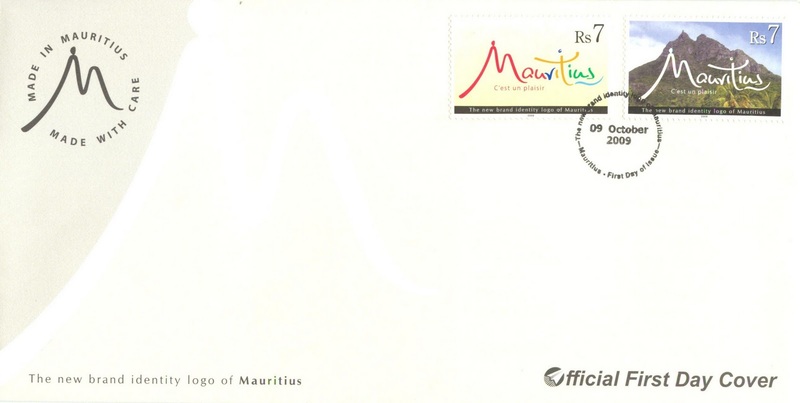 The Mauritius Post Ltd issued on 9th October 2009 a set of 2 postage stamps to commemorate the launching of the new brand identity logo of Mauritius. The logo has been inspired from the country's most valuable asset that exudes the brand values and personality: the spirit of the people of Mauritius. It also reflects the spirit of the place. In the 4 colours of the Mauritius national flag and in the same colour sequence, the logo appeals directly to the Mauritian. The angular 'M' traces an outline of the Pieter Both Mountain with the rock settled on top revealing an intuitive and 'independent thinker'. Recognisable amongst all, the Pieter Both Mountain is an icon itself in Mauritius - an emblem of the spirit of the place. Its pointed style in both logo and reality displays intellectual qualities that include a vast curiosity and ever expanding horizons indicative of Mauritius. If one looks more closely, the capital letter 'M' also appears as the image of a resting woman enjoying the beauty of Mauritius laid before her. The letter 't' mirrors an iconic Mauritian person standing with widespread welcoming arms to demonstrate the spirit of the people, one that is warm and magnetising in personality. The illustration on the FDC depicts a seal of quality that has been specially designed to be applied on packaging only. In Mauritius, people have a sense of care in life that they transmit in their work. This seal of quality is used by accredited manufacturers in Mauritius. Nice blog and fantastic information thanks to you .